Keep little toes happy this Christmas with our range of Christmas gifts for kids. They’ll love our selection of snuggly slippers, sparkly party shoes and splash-proof wellies this winter! For little girls, we’ve got faux fur lined girls' boots which are ideal for winter walks or shopping trips, glittery girls' heeled party shoes for all those Christmas parties, and cosy girls' slippers which are just perfect for both running round the house and snuggling up with a cup of cocoa in front of a Christmas movie. Meanwhile, little boys will love stomping around in our sturdy black lace-up boys' boots, or splashing in puddles in our colourful wellies. And when they get tired, our snuggly slip-on and easy-fasten boys' slippers will keep their toes toasty. 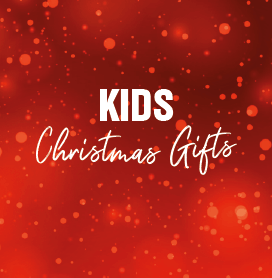 Many of our kids’ shoes, boots and slippers also feature popular characters, so whether they’re into Peppa Pig, Paw Patrol or Spider-Man, you’ll be sure to find their favourites in our selection of kids’ Christmas gifts. Not looking for shoes? We’ve plenty of accessories too, including scarves, gloves and kids' bags. It’s easy to stock up on all the children’s Christmas gifts you could ever need here at Shoe Zone. Order online and get free UK delivery on all items, or click and collect from your nearest store. 144 products from £4.99 to £29.99.